Trigger Pull: The trigger pull on the IWI Jericho 941 was about medium to hard but defiantly not the worst air gun I have tested. After you quickly shoot off a full CO2 cartridge you may need a bit of a break to rest your trigger finger but the actual shooting experience is just fine. Accuracy: Accuracy was pretty good for a double action shooter, I got around a 1.5 inch grouping from a 20 foot away free standing position, shooting just a hair to the left but a bit on the high side. It is unfortunate that the Jericho 941 does not have sight elevation adjustments as it would make a very accurate airgun otherwise. I also put the KWC IWI Jericho 941 through my Chrony Chronograph and got very impressive FPS results, actually starting off and staying well above the claimed manufacturers FPS. My 8 shot average on a new CO2 was a very high 488 FPS, again well above KWC claimed 443 FPS. Build Quality: Very good, the Jericho 941 weighs in at about 2 pounds which is a very hefty weight for a medium sized pistol. The build quality and fit and finish are good all-around with decent usage of metal in the slide, magazine, outer barrel and trigger. Realism: The KWC IWI Jericho 941 is very close to the look, weight, and feel of the real Israel Weapons Industries Jericho 941! Even though it doesn't have a working slide it definitely looks the part with the Licensed trademarks, cut out ejection port, full size drop out metal magazine and recessed metal barrel. Metal Slide and metal outer barrel. All metal full size drop out magazine holds CO2 and BBs. Very accurate IWI Jericho 941 replica with licensing and trademarks. Excellent FPS, well above claimed! Lots of shots per CO2 - close to 100. Good accuracy for a double action BB shooter. Non-blowback and the slide are non-functioning. Non-adjustable rear sights, a bit of a pity with this rather accurate pistol. 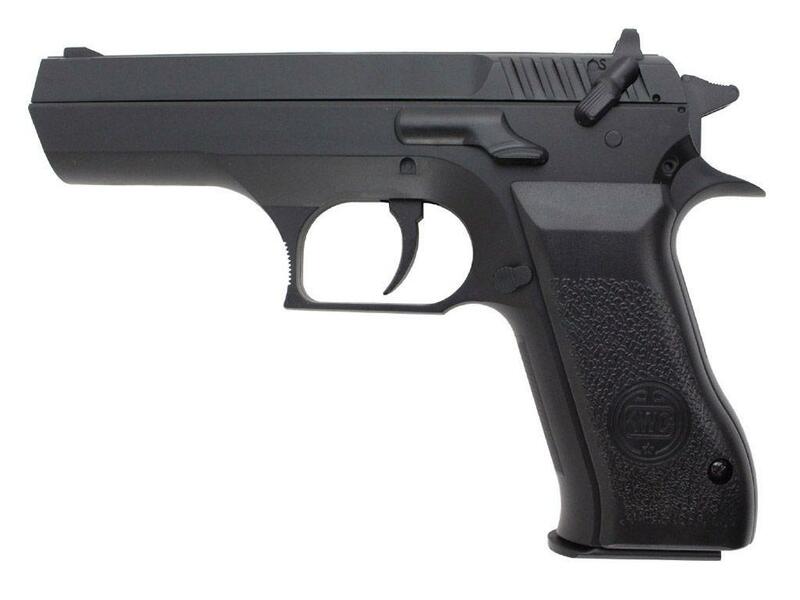 Comments: I ordered my KWC IWI Jericho 941 with two other KWC pistols (The Sigarms GSR and Sig Sauer SP2022), all of them in the lower and more affordable price point, the Jericho 941 is definitely the hardest shooting out of the bunch. For a relatively inexpensive BB gun you get good value for your money, most importantly a very accurate reproduction of the real IWI Jericho 941 firearm! 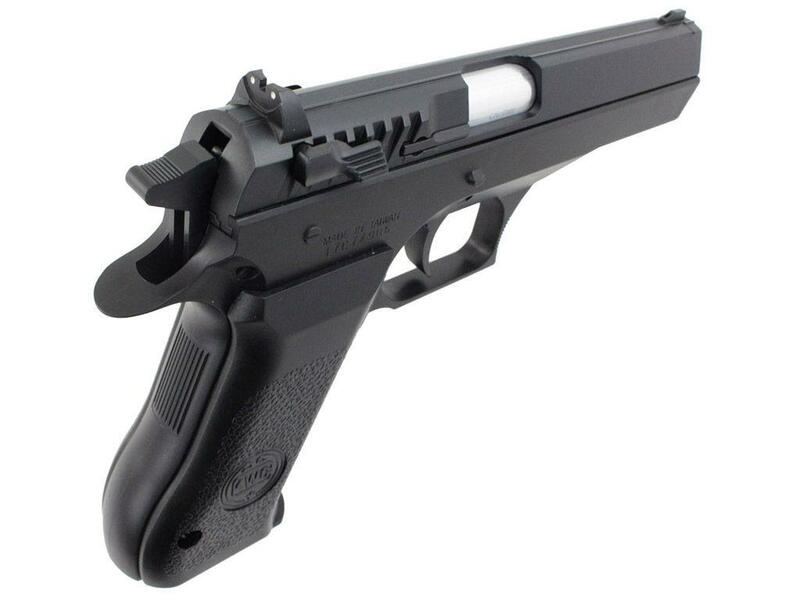 If you want to purchase an air pistol replica that's very hard hitting, accurate, gets lots of shots per CO2, has excellent weight and realism then the Jericho 941 may be the airgun for you? I own 2 of these for when im feeling like dual wielding. The trigger pull is longer than most but once u get used to it u stop complaining about it. I am happy with the consistent accuracy. I have a bunch of extra mags i ordered from replica airsoft. I have used it for 3 years now. Won a bunch of local competitions with this. Pulled off great shots. Dropped it a ton. Broke and repaired it. I still love it. And it loves me. 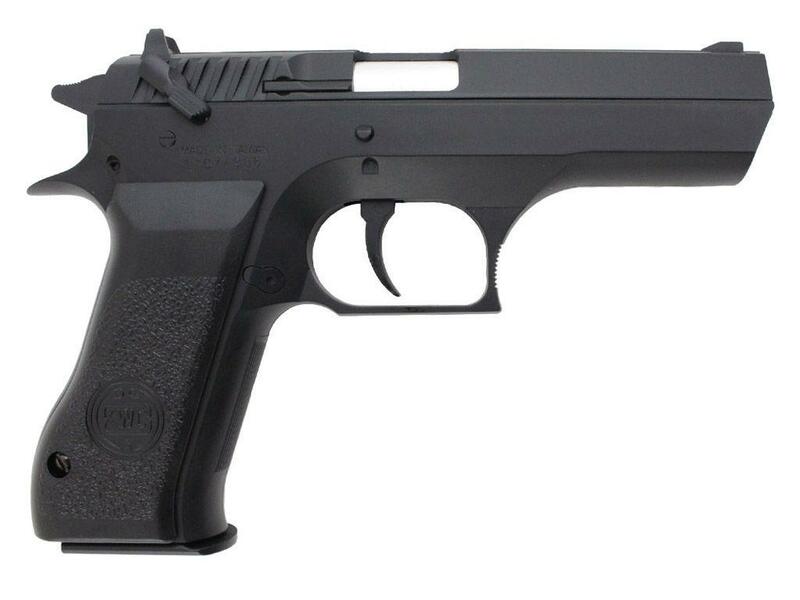 http://www.ReplicaAirguns.com - Cybergun - KWC IWI Jericho 941 Metal Slide CO2 BB Gun Review. This video is a walkthrough review of the Cybergun KWC IWI Jericho 941CO2 BB Gun. I show off the Jericho 941 BB pistol close up and also do a full field test where I first shoot the Jericho Baby Desert Eagle replica through a Chronograph to test out the actual fps ratings and then I also shoot this very accurate BB gun at a target from 20 feet away in a free standing position to see what it can get with an eight shot grouping. The Jericho 941 performed very well in both of my shooting tests! 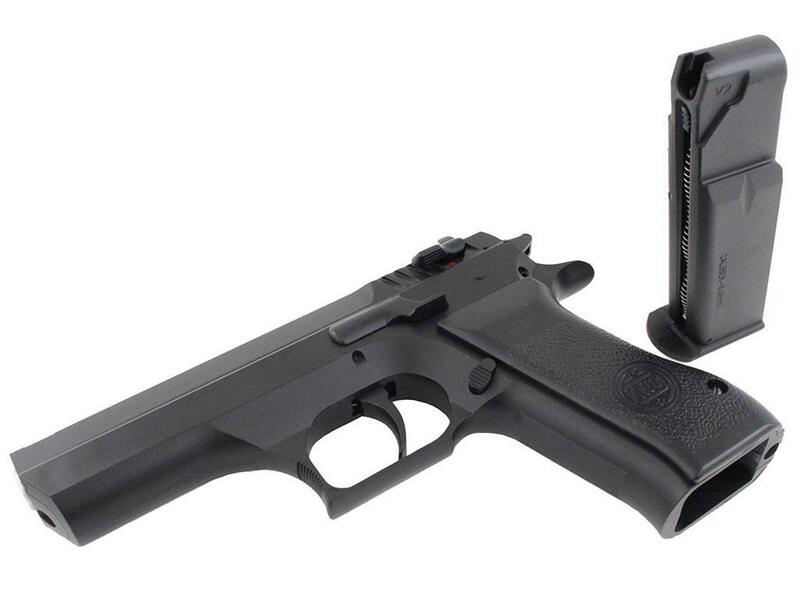 The Cybergun Jericho 941 is a very realistic and well made airgun for an extremely reasonable price tag. If you're looking for a solid, mid sized replica gun which tested to be a very hard hitting and accurate BB shooter, then seriously consider the IWI Jericho 941 BB air pistol as an option. This video is a walkthrough review of the KWC IWI Jericho 941 CO2 Airsoft Pistol. I show off the Jericho 941 Airsoft pistol close up and talk about its specifications and features. How did the KWC Jericho 941 CO2 Airsoft Pistol perform for me? I was expecting some pretty decent fps performance sine the steel BB version was a pretty hot shooter but in Airsoft you don't always want crazy high fps performance or the gun may not be usable in any Airsoft games since it could injure an opponent. My 5 shot Chronograph test using .20 gram Airsoft BB's with a brand new 12 gram CO2 gave me an average of 438 fps which is about as fast as you are going to want an Airsoft gun to shoot. This pistol should be capable of hitting targets pretty far down range.